Brambling (Fringilla montifringilla). Female. Taken at Titchwell, Norfolk, on October 9th 2017. Female. Taken at Titchwell, Norfolk, on October 9th 2017. The Brambling is the same size and shape as a Chaffinch, but is distinguished by a white rump and little or no white on the sides of the tail. The breast is orange rather than pink. 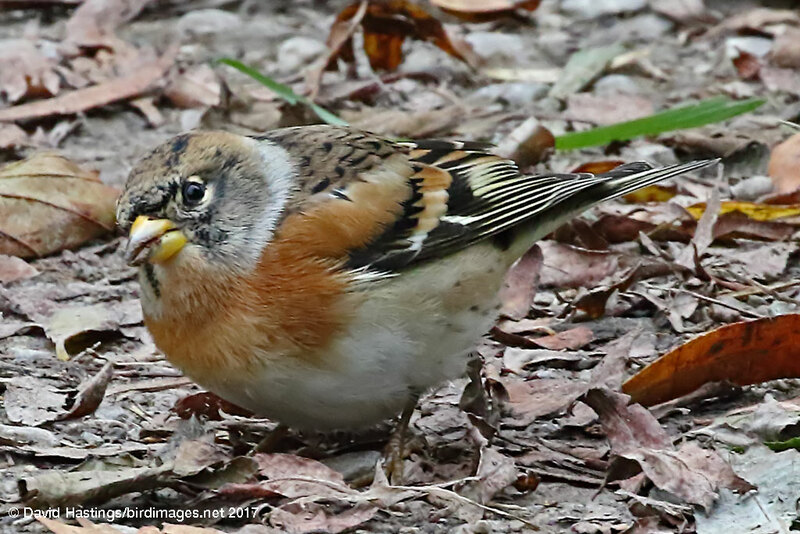 Bramblings breed in Fenno-Scandia, but can be found in much of western, central and southern Europe in winter. Its breeding habitat is upland birch forests. In some winters where beech mast is plentiful, enormous flocks can gather around beech trees. It has green status in the UK. Up to 1.8 million birds can over-winter here.